I recently worked with ESPN as part of a series of artists to contribute some custom cleat designs for an online feature. I lucked out and got my hometown QB Cam Newton and the QB Dak Prescott of my favorite team growing up, the Dallas Cowboys. I love football, I love shoes, I love design...win win. I wanted to share my work and a small glimpse of process. Cam is a larger than life figure and I explored several options in that direction. Ultimately went with the upper right, because it tied in the Superman angle in a clever way and used the space of the shoe the best. I worked in vectors over top of my sketch and a color rendering of the shoe with some reference of Cam close at hand to get the details of the uniform and helmet correct. Once I had the vectors to a place I liked, I took them into photoshop to make adjustments and add texture. Final step was to get the artwork on the shoe template that ESPN provided and distort it so it felt like it wrapped the shoe. For Dak, he's so new to the league, there was less to go on. He's such a solid, efficient player, I envisioned some kind of futuristic, robocop kind of thing. The silver, the blue...I just had a vague idea, but hit on some type that I liked. I started to refine the type and work it into some layouts. I never could get the futuristic vibe to work for me though. I went away from it and started to explore a play on the classic Cowboys type, which went in a really different direction that I didn't like either. 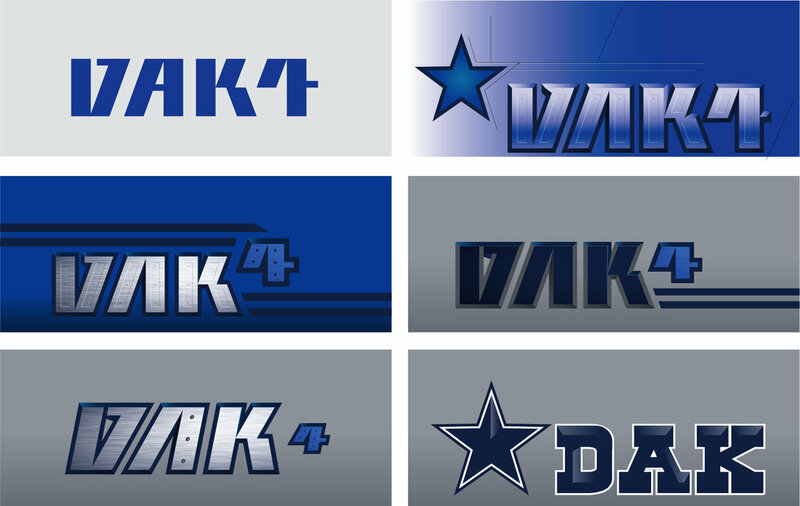 As a change of direction, I started working in a depiction of Dak into the type and liked where it was going. I worked up the base shapes in illustrator and then took to Photoshop for the spray paint effects. I thought this captured the energy I was going for. You can see the entire series here. Thanks to Jason Hutton for letting me be a part.